January 15 – 19>> The new Cubacel bonus! 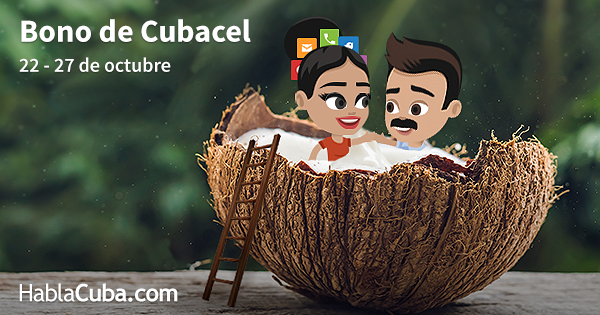 HablaCuba.com will host a new Cubacel promotion starting January 15 until January 19.
https://blog.hablacuba.com/wp-content/uploads/2018/01/FB-Cover-1.png 315 851 Ecaterina Lia http://blog.hablacuba.com/wp-content/uploads/2015/02/Blog.hablaCuba.png Ecaterina Lia2018-01-11 08:51:072018-05-24 13:32:19January 15 - 19>> The new Cubacel bonus! Cubacel promo comes back next Monday! https://blog.hablacuba.com/wp-content/uploads/2017/05/FB-Cover-HC.png 315 851 Ecaterina Lia http://blog.hablacuba.com/wp-content/uploads/2015/02/Blog.hablaCuba.png Ecaterina Lia2017-05-12 15:00:572018-05-24 13:28:29Cubacel promo comes back next Monday! Super Bono is anxious to prove his generosity, so he comes earlier this month: Sunday, March 12 is the big day. And stays until March 17.